You know its a bad day when you are being mobbed by swallows! Add to that intermittent downpours and consistent drizzle and I can understand why this short-eared owl (Asio flammeus) was looking fed up. Sat in a field on a hillock of grass, the swallows diving initially caught my attention. Time and again they were swooping down. Always bombing the same spot. Slowly my eyes adjusted and I saw the short-eared owl. Looking fed up he was being consistently mobbed by these swallows, guarding their nearby nests and young from this perceived predator. Ducking as they swooped nearby, constantly scanning the sky for the next incoming fly past he just sat there and accepted the onslaught. Eventually he decided to move on. Lifting off the swallows followed him. They allowed him to settle on a fence post before starting their attack all over again. 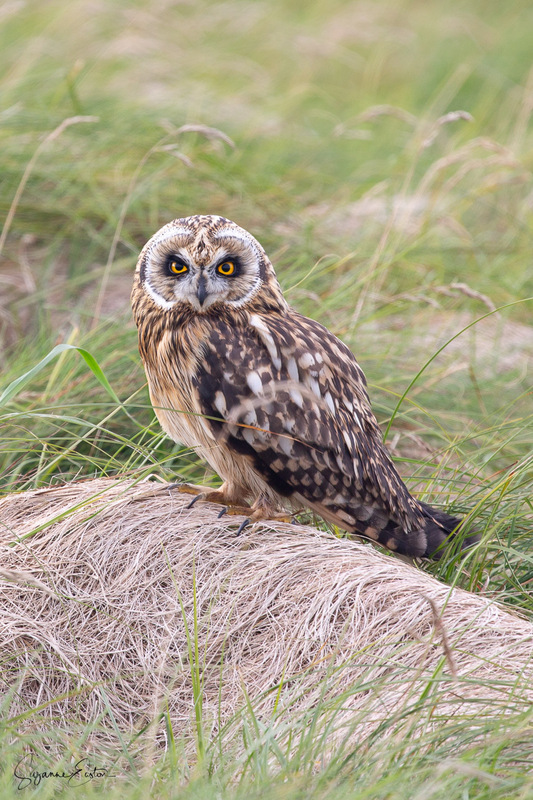 Short-eared owls can appear anywhere at any time on Sanday. This encounter was in the middle of the afternoon about 10metres from the side of the road. There are about 70 pairs over the whole of Orkney. They spend the spring and summer in the hills moving to lowland rough grass and heather in the autumn and winter. Some migrate for the winter but they can still be seen throughout the year. Just keep looking on grassy hillocks and fence posts!